The Public safety vest standard wsa created in response to public safety user groups' demand for a high visibility safety vest that differentiated from ANSI/ISEA 107-2004. The primary concern was a need for flexibility of design thast would provide tactical capability not achievable with ANSI 107 garments. 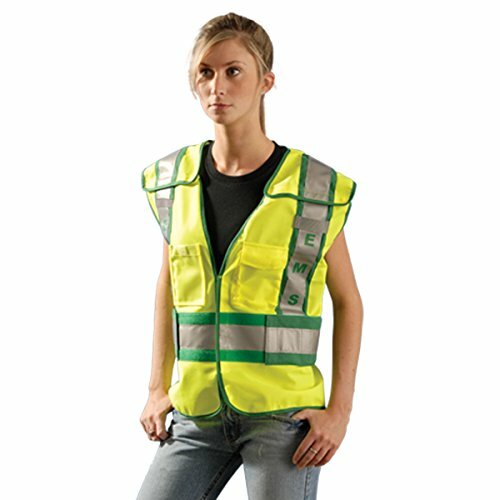 Additionally user groups expressed a desire to have a hi-vis garment standard intended for law enforcement, fire and emergency responders that would be distinct from ANSI 107, therefore avoiding interchangeability with construction worker's vests. The New ANSI/ISEA 207-2006 Summary points. The new standard suggests many design options, such as breakaway, colored identifiers, loops, pockets, badge holders, mic tabs and ID panels. Occunomix Premium Public Safety Vests incorporates all these NEW INOVATIONS. The design options are intended to encourge innovative ways to meet end user needs for design functionality, while still offering an effective high vis safety garment. The design allows for easy access to equipment worn on a belt. 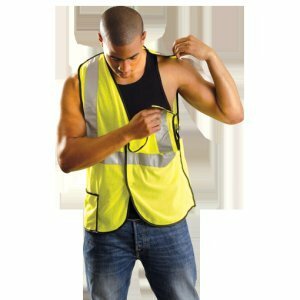 OccuLux® High Visibility Break-Away Vest includes hook and loop fasteners at the top, sides and front which breakaway when tugged with moderate force, to help prevent workers from being caught and pulled. Vest also features: ANSI Compliant 100% polyester, bright, lightweight, breathable open weave knit mesh background material. 2" 3M Scotchlite reflective tape - One 360° horizontal stripe plus two vertical shoulder stripes. Multiple Handy Pockets: One pocket outside right front bottom with pencil/pen subcompartment plus one utility loop outside left chest for ID cards, microphone and other small tools or devices plus one inside breast pocket. Machine washable. OCCSSBRPC-YM Features: -BREAKAWAY MESH. -UNSPC CODE: 46181500. -Clothing Type: Vest. -Clothing Size : Medium. Product Type: -Reflective. Product Type: -Mesh. Color: -Yellow. Color: -Orange. Type I: -Safety Vest. Reflective Tape: -Yes. Breakaway: -Yes. High Visibility: -Yes. Size: -M. ANSI: -Class 2. Mesh: -Yes. Quantity: -Single. Generic Dimensions: -OccuLux® High Visibility Break-Away Vest features 100% lightweight solid or mesh polyester fabric, one 360° horizontal and two vertical shoulder stripes of 2'' wide 3MTM ScotchliteTM reflective tape with two-tone orange trim..
OCCSSBRPC-YXL Features: -OccuLux® High Visibility Break-Away Vest features 100% lightweight solid or mesh polyester fabric, one 360° horizontal and two vertical shoulder stripes of 2'''' wide 3MTM ScotchliteTM reflective tape with two-tone orange trim.. -BREAKAWAY MESH. -Hook and loop closures at the top, sides and frontOne inside pocket, one outside pocket with pen compartment and a utility loop. -UNSPC CODE: 46181500. Product Type: -Mesh. Product Type: -Reflective. Color: -Yellow. Color: -Orange. Type I: -Safety Vest. Reflective Tape: -Yes. Breakaway: -Yes. High Visibility: -Yes. Size: -L. ANSI: -Class 2. Mesh: -Yes. Closure Type: -Hook & Loop. Quantity: -Single. 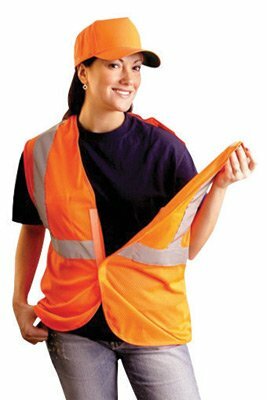 OccuLux(R) High Visibility Break-Away Vest includes hook and loop fasteners at the top, sides and front which breakaway when tugged with moderate force, to help prevent workers from being caught and pulled. 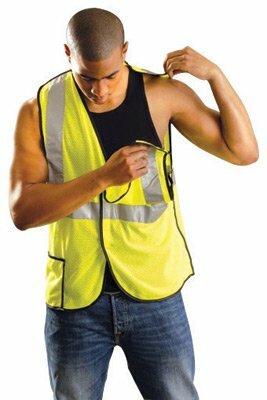 Vest also features: ANSI Compliant 100% polyester, bright, lightweight, breathable open weave knit mesh background material. 2" 3M Scotchlite reflective tape - One 360o horizontal stripe plus two vertical shoulder stripes. Multiple Handy Pockets: One pocket outside right front bottom with pencil/pen subcompartment plus one utility loop outside left chest for ID cards, microphone and other small tools or devices plus one inside breast pocket. Machine washable. Looking for more Occulux Breakaway Vest similar ideas? Try to explore these searches: Josie Maran Tinted Moisturizer, Hunter Pin Measures, and Smart Dvd Ripper. Look at latest related video about Occulux Breakaway Vest. Shopwizion.com is the smartest way for online shopping: compare prices of leading online shops for best deals around the web. Don't miss TOP Occulux Breakaway Vest deals, updated daily.